Her work consists of 2 major phases. From 2001-2015 she created art collections exploring different themes of interest in a technique combining acrylic, cement and crystals. Her works have achieved notable prices at various auctions around the world. In 2017, 2015, 2014 and 2011, Milena ZeVu participated at the annual auction organized by FAM, foundation of H. S. H. Princess Stephanie in Monte Carlo, with her works from collections ArtWalks and ‘Magnificent Nature’. In 2014, Milena collaborated with burlesque diva Dita von Teese on a project called ‘Dita in her car’ which was homage to legendary artist Tamara de Lempicka. Her work ‘Armour of Light’, an impressive Bonelli Eagle sculpture, created under the patronage of H.S.H. Prince Albert II of Monaco, was sold in October 2009 at the Sotheby’s led auction in Monte Carlo for the highest selling price among 54 similarly themed works. In December 2007, she participated at the Professional Footballer Association Centenary Gala event in UK, during which her work ‘The Crystal Bail’ which she created with signatures of football players was sold for the benefit of the Children’s Hospital in Manchester. In June 2005, Milena had a solo exhibition in the Museum of Applied Arts in Budapest (Hungary) with her work Tapittura, a massive painting/rug installation, which was inspiration for her art concept ArtWalks. ART WALKS. Can Art walk? 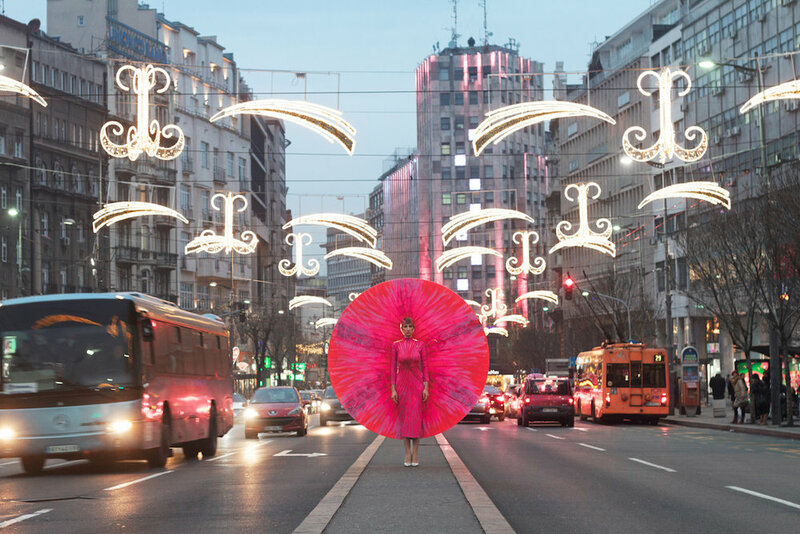 ArtWalks is an art-performance where Milena becomes part of large paintings, which she takes outside her studio and walks the streets of different cities. By being an inseparable part of a moving artwork, the Artist balances different roles and aspects of her life, explores different dimensions of reality, at the same time measuring the aliveness of her own soul. ArtWalks is her attempt to make art more dynamic, to create a more profound connection with an artwork, while at the same time trying to distance the Artist from the existing frames and spaces that can be limiting factors. 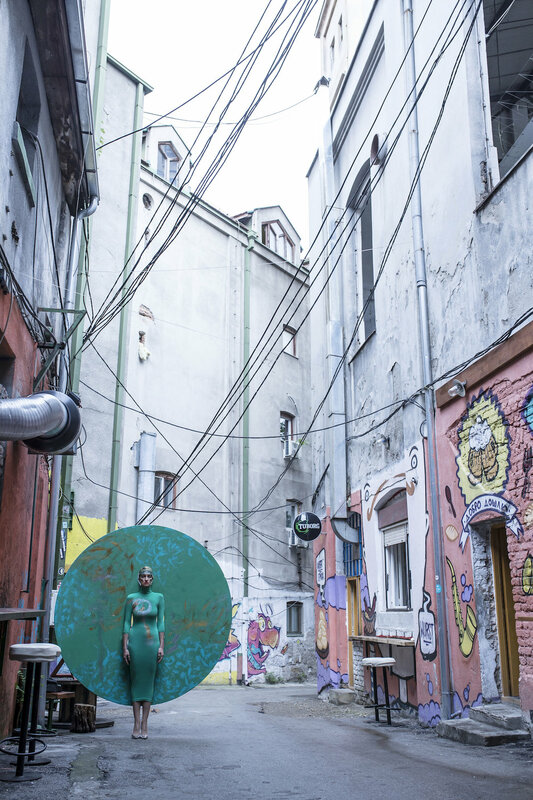 In March 2019, she created an ArtWalks performance, which was an homage to Serbian artist Milena Pavlovic Barilli, in the Maison de Jevrem Grujic in Belgrade, Serbia. In June/August 2018, her work ArtWalks 139 Belgrade was part of the 250th Royal Academy of Arts Summer Exhibition in London.